Note: Because I am just a little ol' Bookworm, I've decided I am not one to try to "review" classics. However, since one of my goals for 2011 is to read more classics, I do want to reflect on the experience of reading each one. Hence this post's title: "Reflections: The Moonstone by Wilkie Collins." As always, I appreciate feedback and would love to hear thoughts on this approach. 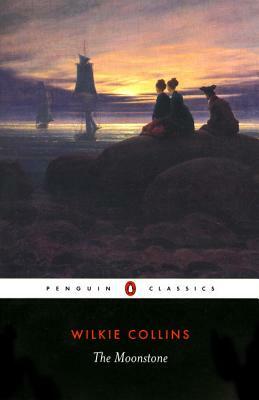 The Moonstone is one of those darling Penguin classics that has sat on my shelf for ages and yet gone unread for just as long. It is also one of those books I read while thinking, "Why did I wait so long to read this?" The Moonstone, though definitely wordy, and definitely drawn-out, in no way feels bulky or cumbersome. Collins' well-known novel is the story of an infamous Indian diamond, known in legends as "the moonstone." The gem, stolen from the Hindoo [sic*] temple of the Moon God, is rumored to bring a curse on anyone who possesses it. When it is given to the young Rachel Verinder as a birthday gift, it draws the attention of family members and neighbors and three mysterious Hindoos - and then it disappears. Rather than a straight narrative, the plot is cobbled together by what we are told are accurate accounts by those who actually participated in events, drawn together by a member of the family to preserve the true story for years to come. This presents the reader with an interesting cast of characters - from the senior house-steward to the Verinder family, who proves a humorous, slightly pompous, and ridiculously absurd narrator, to a Christian zealot, a lady who litters households with pamphlets on ladylike behavior and verges on hysteria. I often questioned these not-so-trustworthy narrators, but never begrudged them their inevitable biases. Remarkably (to me, at least), I often found myself laughing out loud at the sheer absurdity of some of their claims, written by their own hands as the most normal thoughts in the world. I suppose this was intentional, so might not seem remarkable, but the fact that these pokes at fun have survived the 150 years since their writing and still prove entertaining says a lot about the quality of Collins' humor. After all, satire is a timely business. The Moonstone is generally noted to be the first detective novel of its kind, paving the way for the Holmes and eventually Miss Marples that lurk in literature to come. Savidge Reads, however, recently laid that title at the feet of Edgar Allan Poe's Murders in the Rue Morgue. A quick search of the ever-reliable and never-citable Wikipedia brings up evidence to support both claims, so let's just call it a tie, shall we? Bottom line: Whether it was the first of its kind or not, The Moonstone is a triumphant effort in the realm of the modern whodunit. It is sad to see that the genre has descended into Alex Cross and the like, but even the most anti-mystery reader should turn an eye back to Collins, whose combination of historical detail, family intrigue, finely-wrought analysis and ever-timely humor presents a detective novel that may be lengthy, and a bit wordy at times, and a bit trying with the cliffhanger chapter endings, but proves to be well worth the hours invested in it. And now, I'm off to find some Sherlock Holmes. * Throughout the text, Hindus are consistently referred to as "Hindoos," which I assume is not a mistake but instead was the term commonly used at the time of writing. I love MOONSTONE and WOMAN IN WHITE -- glad you're getting in to Collins. I really enjoyed The Moonstone. So far it's the only Collins I've read, but I have The Woman in White waiting for me on my bookshelf. Also, I like your "reflections". It's hard to give classics a traditional review and I think this is a nice departure. I haven't read this one yet, but I'm in the middle of The Woman in White, and I do like the story being told my various people as they were involved in the narrative. Wilkie is pretty cool, and I'm looking forward to reading Drood when I'm done with TWiW. Trisha - I'm hoping to get to Woman in White sometime soon! I really enjoyed my first Collins and I've heard Woman in White is funnier. Or wittier might be a better word? Brenna - Thanks for the feedback. I just felt, when writing this, like there isn't much to say that hasn't already been said. Andi - I've heard really good things about Drood, and I'm definitely intrigued.